Should be a 3 mana 3/3 imo or a 4 mana 4/4. "Why destroy when you can control?" says Kezan aka Illusive Man to Eater of Secrets aka Shepard. Kezan Mystic + Brann Bronzebeard = Poor Freeze Mage. nice knowin' ya, kezan mystic. Eater of Secrets, your table is right this way. not against secret paladin. but against mage and hunter? sure. and have your Kezan Mystic at full health. Sometimes this card is useless in a deck. But the times where it isn't can literally be game winning. I play this card because it's funny. Also because I run a mage deck with secrets and stealing back the secret they stole from you is really funny. Them then stealing it back with a second Kezan Mystic has only happened to me once but it was so hilarious I didn't mind losing that game (which didn't even remotely hinge on that secret). In all seriousness it's not actually that useful against secret pally, but it's pretty good against most mages and excellent against hunter. So if you have something you feel like you could swap out and struggle against those it might be worth an include. Alternately just stick it in if you like funny games. I never see this card, and I have NO IDEA why. This is the most secret heavy meta I've seen since I started playing. Why isn't it more popular? People still undervalue this card as useless against many classes. I don't know why, when you're not facing that classes at all (hi Shaman, hi ROgue!). Don't forget its still great against hunter. This card has won me so many games. I can't believe how many people are saying it's awful. 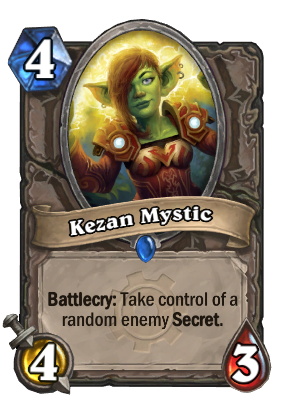 Because it's so weak against 6 out of 9 classes, I actually think it should just destroy all enemy secrets instead of stealing one random. Finally crafted two of these. I am just personally sick of Mages/Hunters on ladder. Hunter players wake up screaming in a cold sweat from this card. Its really good in the actual meta: a lot of control and mid-range mages, and a lot of Hunters.